Shri is the sacred sound of cosmic auspiciousness and abundance and when written or spoken it carries a spiritual potency (shakti). Written as Sri or Shree or Sree or Shri, it stands for affluence, grace, wealth, light, lustre, splendour, beauty, loveliness and authority. and totality of the material world or energy, in which she is called Mother Earth. The analogy of milk that transforms into yoghurt is used to demonstrate how Sri who is transcendental, transforms into Durga in this material world. Durga is approached by her devotees for fulfillment of material desires. 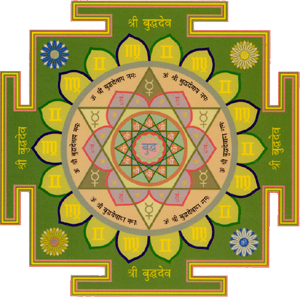 She is also called “the beauty of three worlds” and in this context she is called Sri Tripura Sundari whose magical diagram is called the “Sri Yantra”. Goddess Laxmi is a soothing, kind, warm and approachable mother figure who willingly intervenes in the lives of devotees. When asking Visnu for grace or forgiveness, the devotees always approach Him through the intermediary presence of Laxmi Devi. Sridevi or Laxmi as the power and consort of Lord Vishnu, is present on His chest on the heart, as She is the embodiment of love, from which devotion to God or Bhakti flows. 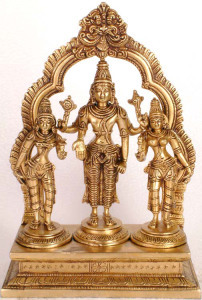 It is through Love/Bhakti or Laxmi that the atma or soul is able to reach God or Vishnu. She is also the personification of the spiritual fulfilment and is described as an ocean of compassion and mercy. Maha laxmi is liberal and can infuse our hearts with spiritual knowledge without considering our qualifications. She resides within the hearts of Her devotees. The name Sri always precedes the Lord’s name for example: Sri Narayan, Sri Krsna. Why ? The significance of this is that Narayan is never without Her, He is the energetic and She is His energy, and in this way they are simultaneously one and different. The yin yang concept symbolises this oneness and difference. 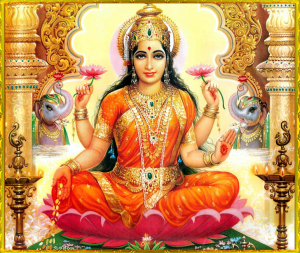 She also presides over 16 forms of worldly wealth which she easily grants: Fame, Knowledge, Courage and Strength, Victory, Good Children, Valor, Gold, Gems and Other Valuables, Grains in abundance, Happiness, Bliss, Intelligence, Beauty, Higher goals, High Thinking and Higher Meditation, Morality and Ethics; Good Health, Long Life. Although Mother Laxmi is worshiped as the goddess of fortune, when she is worshiped with Narayana, the worshiper is blessed with not only wealth but also peace, prosperity and spiritual protection. They can be worshiped in forms, such as Laxmi Narayan, Laxmi Narasingha, Sita Rama and the original source Sri Sri Radha Krsna. The ancient scriptures of India ultimately advise us all to pay extreme regards to Laxmi, and any person who disregards her is sure to fall on evil days. This means that wealth should be well protected and properly used. The misuse of wealth is sure to generate negative karma, and the resultant suffering and unhappiness that is accompanied with it. Laxmi devi’s quality of being chanchal, denotes her fickle nature. She tends to not stay in one place too long and can just as easily leave as she arrives ! 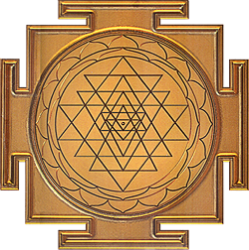 However honouring Sri Yantra and Meru Chakra with Her mantra, offers you an opportunity to petition her to remain here. Filed Under: History, Science and Practice, science and practise, Vastu / Feng-Shui tools, Vastu and Finance, Vastu and Health & Well-being, Vastu and Relationships, Vastu and Spirituality, Vastu and Wealth, Vastu in the Home, Vastu in the Workplace Tagged With: affluence, approachable, beauty, bhakti, Bhudevi, Bliss, chanchal, cosmic auspiciousness, courage, devotion, Durga, education, elephants, embodiment of love, empowers and uplifts, fame, feminine energy, fickle nature, Gems, Goddess, Goddess of fortune, gold, Good Children, good health, grace, Grains in abundance, Granary wealth, happiness, High Thinking, Higher goal, Higher Meditation, intelligence, kind, Knowledge, Laxmi, Laxmi Narasingha, Laxmi Narayan, light, Long Life., loveliness and authority, lustre, material desires, Monetary wealth, Morality and Ethics, mother earth, mother figure, Narayan, negative karma, Other Valuables, progeny, purifies, sacred sound, shree, Sita Rama, soothing, spiritual energy, splendour, sree, Sri, sri laxmi devi, Sri Sri Radha Krsna, Sri Yantra, Sridevi, strength, symbols of wealth, universal mother, Vaikuntha, Valor, victory, Visnu, warm, wealth, Wealth of continuity, Wealth of courage, Wealth of knowledge, Wealth of victory, yin yang.